Many people think that mindfulness is about quieting the mind and relieving stress. Sure, your mind will quiet to some degree, but you’ll never cease thinking (nor is that the point), and stress relief is only a byproduct. That’s not to say that those things aren’t important, just that there’s something more important in your practice of mindfulness than simple stress relief. It may very well be though that if you approach your practice from the perspective of simply attaining relief from your stresses, especially if you only ever sit in meditation and never practice mindfulness in your daily life, that you’ll completely miss the most important gifts of mindfulness practice. It’s for this reason that you should approach your practice with a universal perspective. What I mean by that is, understand that mindfulness is really about shining a spotlight on your entire life. That is, every aspect of your being, and not just as a simple stress reliever or performance enhancer you do for 15 minutes each day. The fact that we’re all intrinsically connected isn’t some fluffy principle someone made up, it’s something which you can experience right now in your daily life. But the way we usually live our lives our awareness is hovering right below the signs so to speak. So we rarely, if ever, see it. Once you begin practicing mindfulness, or living with greater awareness in the present, you’ll begin to see the natural rhythm of life and how we all depend on so many different things just to come to be as we are in the present and to continue on living each day. And this isn’t limited to people either. This includes all other living and non-living things- on land, in the ocean, and in the sky. This can be seen in very concrete ways- in the way we depend on the coral reefs or on the delivery of our local food and water supply for instance- but also in a much deeper way. In a very real way, we exist in the clouds, in the rain, and in the mountains. And they in us. This single realization can change the way you live your entire life. From the way you treat others, to what you devote your time to, to the products you consume, and the causes you support. Beyond that you’ll realize is that we’re not just interconnected, but that this world is downright crazy. What I mean by that is, have you ever thought about the amount of work the world at large had to put in to deliver all the products that exist in your home to you as they are? From your soap, to your shampoo, to your razor, to your shoes, your clothes, coffee or tea, each item on your breakfast plate, your stove, refrigerator, computer, and everything in between, your mindfulness practice will get you to begin seeing things much differently than you once did. Think about the amount of people, the amount of machines, the amount of worldly resources, and the thousands of hours of time it took to create and further manage and develop this elaborate system of life we’ve developed for ourselves. This is the life you live in every day, and realizing this can become a source of great fascination, joy, and gratitude. But if you go beyond this, you realize we’re just acting out what we know, because this is exactly how nature has operated all along. Always perfectly at balance, yet unbelievably complicated and seemingly fragile on the surface, once you realize this the world is revealed as being both unbelievably fascinating and awe-inspiring. Once you’ve been practicing mindfulness for some time, you may notice a spontaneous source of creativity trying to leap out from you which is beyond your comprehension. In other words- it feels like the source of your creativity isn’t “you” at all. At least, the you that you typically associate as being all of you (not just a “bag of skin” as Alan Watts so eloquently put it). This will be especially noticeable if you didn’t typically consider yourself the creative type before. It’s well documented- as well as things are documented in Zen at least- that Zen training often “compels” students to begin expressing themselves through “traditional” art. This isn’t something which can easily, or even properly, be put into words (and much of it can be left for interpretation). But know that mindfulness will bring you in touch with your inner creativity– which we all have- as the ground of your being seeks to express itself spontaneously through you. Becoming more aware of yourself- what you do each day, what you think, and what you feel- and everything occurring around you in the present moment changes literally everything about your life in the most profound ways. Or perhaps more accurately I should say that it changes nothing but your perspective. That’s really what happens when you practice mindfulness. You’re going to feel like your entire life has changed from practicing mindfulness, but really nothing around you and even you in large part has changed all that much. It’s simply your perspective changing, or opening up, which has changed everything. I’m not saying things haven’t changed, that you just perceive that they’ve changed and are somehow fooling yourself, I’m saying mindfulness will teach you that your perspective is literally everything there is. When everything is crumbling down around you, rooting yourself to the present moment with mindfulness will not just allow you to weather the storm but also allow you to continue to find beauty in your daily life. There is no other place and no other way we’ll discover peace and stability than through discarding all other false notions and realizing how firmly rooted we are to the present moment. So much of the chaos that exists in our minds comes from regretting and reflecting about the past, worrying about and building up the future, and imagining all kinds of possibilities in between. This thinking will never completely cease, but the problem is we get so caught up in it thinking we’re off somewhere else, when the only place we ever really are- even when we’re thinking- is in the present moment. On top of that, it’s the resisting of the present moment that causes so much pain and confusion for us as well. When something happens, we often fight it, and so by resisting the present reality we cause friction to ourselves and our life at large. Mindfulness will fully reunite you with the present moment and show you the peace and equanimity that exists within it. This is a lesson no one should live without. We can find some measure of happiness in memories, in recollecting about positive experiences, and therefore feeling better about our lives, but this form of happiness isn’t possible for everyone and as we go about our lives past experiences take on new meaning, so this doesn’t necessarily last forever. That’s on top of the fact that these memories always have to fight against the present state of our lives, so they don’t always have the same effect. Experiential happiness- that is, living in the present moment and experiencing all the little joys life has to offer (which are really significant when looked at closely with mindfulness)- is a renewable source of happiness that can never be taken from us. This is where true happiness exists. By practicing mindfulness, and becoming better attuned to the beautiful little intricacies of life, you begin to cultivate a great sense of joy in your daily life. And this can never be taken from you, no matter what’s going on in the rest of your life. Traditionally, the East had a much different outlook on time than those in the West. In fact, it’s literally impossible to find any textual evidence of when the first Hindu scriptures were written because they never kept dates. Yes, that means for potentially thousands of years they essentially had no concept of “history” as we know it. In the East, the view of time was more cyclic than linear like it’s always been in the West. By that I mean the belief was that the same general cycle of occurrences happened over and over repeatedly. This view likely arose from their understanding of how we live our lives more than anything. When looked at more closely, this cyclic view of time really is the way we live our lives- always going through the motions, repeating the same cycle of pain and suffering usually without end or until we realize the truth. This view of time is largely helpful as it allows us to realize we need to transcend this cycle of suffering. The West’s interpretation of time on the other hand, theorized to have been born from Judaism itself, is linear. This means that time is a straight line extending out indefinitely, no period of time every overlapping with another. What does all of this mean, and why does it matter? It’s because of this linear view of time, or the fact that we’re controlled by it, that we rush around so much. We believe we need to make the most of every single second of our lives for fear of wasting time. In this view, time is a limited resource. This forces us to rush around all day long trying not to waste a single minute of life. Which, ironically, keeps us from ever really living. What’s far more important than time, no matter what your view, is to be fully present to this moment and attending to your life right now as it is in this very instant, as opposed to always thinking about later today, tomorrow, or next week. Some of this is necessary, but when you’re always living in this way you’re trying to catch something which can never be found, and you end up spending your entire life doing nothing all that important. 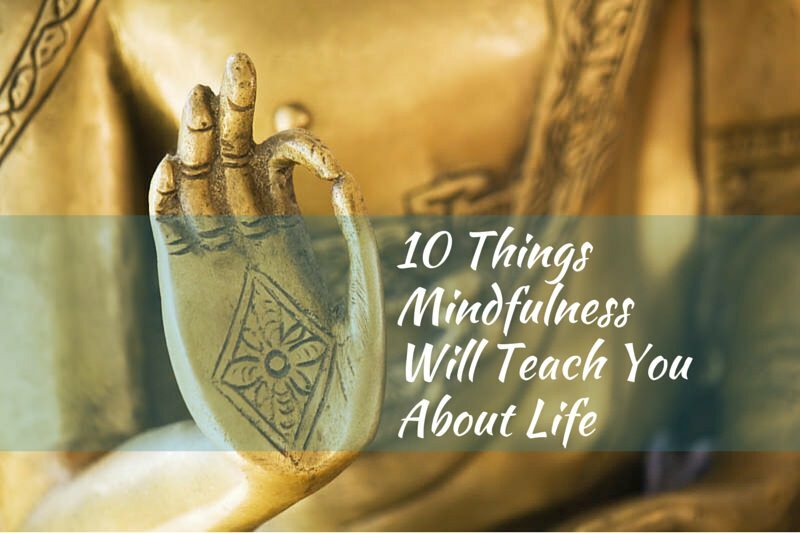 When you practice mindfulness, you begin to realize that slowing down isn’t just nice, it’s our natural way of life and most conducive to our health and happiness. Self-awareness is the very thing which makes us humans so special. And while it’s also the very thing which causes us pain and suffering, it’s also the very thing which allows us to awaken fully to the truth and beauty of life itself. When you begin to see just how many different and significant ways that mindfulness can transform your life, you’ll realize that awareness is our greatest gift. And this gift should be nurtured and developed on a daily basis. Mindfulness will teach you that a keen and non-judgmental self-awareness is the key to thriving in life. Any and all of the pain we experience is due to our resistance to the present moment experience, and part of that comes from the friction we cause ourselves when we try to force things to happen when they’re not ready. Some things just take time to develop. Or, perhaps more accurately, some things just happen on their own clock. They don’t necessarily need a lot of time, but rather that they’ll develop at their own speed and you can do little to hurry the process along. This is something you’ll learn very early on in your mindfulness practice, as mindfulness works in exactly the same way. You can’t race or rush in any way to develop your mindfulness faster than someone else. You can dedicate yourself, and that will make a huge difference, but there’s no shortcuts, and it ultimately develops on its own once you’ve dedicated yourself. And through your practice you can begin to notice how the rest of life works in the same way. Some things you just can’t rush. The natural flow of things will occur on its own, and any pushing or pulling you do will just cause friction and result in pain for you. Mindfulness will teach you that you just need to let some things develop on their own. Literally everything, even your thoughts of the past and the future, exists in the present moment. Everything we ever experience is nothing other than the totality of the present moment. The sooner you fully realize this the sooner you’ll discover peace and happiness. We get so wrapped up thinking about this or that and we end up losing track of ourselves altogether. But this takes us away from our one and only home, the present moment, and we end up fooling ourselves into thinking that something exists outside of this moment. But nothing does.